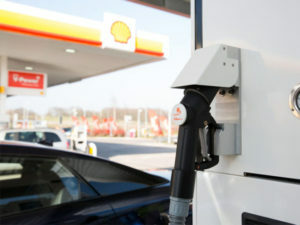 Shell has opened its first hydrogen refuelling station in the UK at its Cobham service station on the M25. The new hydrogen station is the first of three Shell plans to open in the UK in 2017. The new hydrogen station has been supplied by ITM Power and is the first of three hydrogen stations Shell plans to open in the UK in 2017. The hydrogen is generated on-site using an electrolyser which requires only water and electricity to generate the hydrogen gas. The opening of the new refuelling stations follows similar sites in California and in Germany where Shell is part of a joint venture with the ambition to open a network of up to 400 hydrogen sites by 2023. Shell is in the process of assessing the potential of future projects in the United States, Canada, Switzerland, Austria, France, Belgium, Luxembourg and the Netherlands.